A deep and passionate network of alumni, parents, and friends of the College provides opportunities that enable students to hit the ground running upon graduation and have an edge in a highly competitive job market. That generosity is what fueled Home for the Holidays, a unique career-exploration program 61 students participated in over winter break. 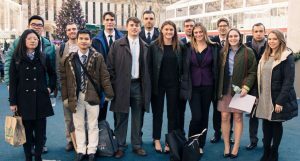 Through this four-day rotational career trek, students experienced professional life in one of three vibrant urban environments: six students visited Chicago, 41 traveled to Boston, and 14 went to Manhattan. This complemented the College’s long-standing externship job-shadowing program, which was also held in January. Students in each city learned practical advice and skills (such as writing a résumé and making a stock pitch) while also gaining a sense for what careers, employers, and graduate-school opportunities are available in each locale. 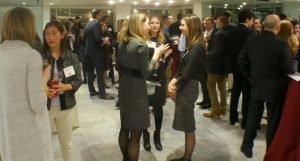 In addition, students had the chance to network with professionals—relationships that can forge the way to future internships and employment. Each Home for the Holidays program was organized and orchestrated by the College’s Regional Advisory Councils in partnership with the Offices of Career Services and Alumni Relations. Alumni, parents, and friends of the College joined forces to provide an experience that would prepare students for the job market while also increasing local employers’ awareness of the Lafayette talent pool. 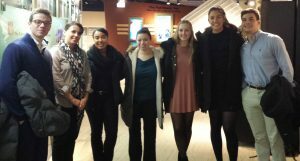 The pilot Home for the Holidays program was run in January 2017 by Bram Bluestein ’69, managing partner of Bluestein & Associates in Chicago. The success of that inaugural session, which Bluestein branded “A Taste of Chicago,” became the model for additional programs in Boston and Manhattan, which were spearheaded by Regional Advisory Council chairman Todd Wiltshire ’86, vice president of capital markets with Fidelity, and vice chairman Sebastian “Benny” Crapanzano ’97, managing director in Morgan Stanley’s Institutional Securities Group, respectively. While each city’s programming was unique and independent of the others, Bluestein, Wiltshire, and Crapanzano all worked with a similar goal: to unite their local Pard communities to enhance students’ educational experience and encourage their future employment within their local professional networks. Indeed, feedback from hosts and participants alike has been so overwhelmingly positive that Bluestein, Wiltshire, and Crapanzano are discussing how they can work with career services to deepen and broaden the program in the three cities and also expand into additional ones. As organizers look ahead to plan for January 2019, here’s a look back at their successful 2018 programming. The professionals: Students had the opportunity to learn from and network with professionals from Chicago’s Federal Reserve, HERE (global software technology company), Matter (health care incubator), Connectory (digital startup incubator), McNally Capital (private equity firm), and Bluestein and Associates (venture capital firm). 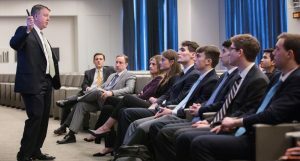 The highlights: “One of the corporate presenters said to me that he thought the Lafayette students were as sharp as some people who have already graduated college,” Bluestein says. Why Boston? 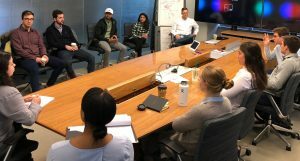 “There is a strong network of alumni and parents in Boston, and there is a wealth of opportunities in the finance, life sciences, and technology industries, as well as many excellent graduate schools for those looking to continue their education,” Wiltshire says. The format: Wiltshire created three unique career tracks for students to choose from: finance, technology, and life sciences. Each of the programs had its own itinerary of expert speakers (a mix of alumni, parents, and other Boston-based professionals), interactive skill-development activities, and tours of facilities relevant to each field. While each agenda was geared specifically toward a particular track, Wiltshire brought the tech and finance tracks together for a tour of Fidelity’s Center for Applied Technology, where students learned how his firm coalesces the fields of computer science, engineering, and finance—similar to the interdisciplinary approach of the College. The professionals: Wiltshire arranged an extensive lineup of speakers and hosts for students across all three tracks to gain insight from. They represented Harvard Business School, Harvard Medical School, Cambridge Associates, Fidelity, Thermo Fisher Scientific, MassBio, Novartis Institutes for Biomedical Research, Lantheus Medical Imaging, Citibank, and Modera Wealth Management, among others. Why Manhattan? “Beyond being the financial capital of the world, Manhattan’s close proximity to Lafayette makes it a likely location students will end up in for internships, employment, or graduate school,” Crapanzano says. 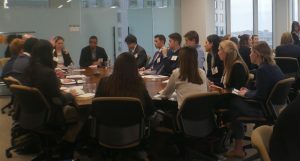 The professionals: The expert participants and hosts represented a variety of occupations and firms in the Manhattan financial industry, including Citigroup, Bank of America, Ernst & Young, BlackRock, Brown Brothers Harriman, and Morgan Stanley. Whether you are an alum, parent, or friend of the College, your support and participation in externship, internship, InternShift, and rotational career treks are valuable. Learn more about Lafayette’s career-exploration programs. Love the way Lafayette is expanding its capabilities.